As we turn our attention to the spring season the Staglers team is ready for the year ahead. We are all waiting for the deer antlers to naturally fall off the stags after they have completed their mating season. Fortunately the Staglers Store is holding impressive stocks of whole antlers and cut, prepared deer antler dog chews. We can confidently guarantee not to run out in the Spring of 2015 this gives us a competitive edge over some of our competition who are larger businesses and always struggle to fulfill orders at this time of year. Our workshop has prepared deer antler dog chews ready to be shipped to customers and trade suppliers alike. So what are your choices? You can go to www.staglers.co.uk and buy online in a few easy steps and receive fast, reliable delivery. If you run one of the below, or know a friend who would like to stock us give them this blog today! If you need a reliable supplier, in easy to handle quantities (or big orders too….) give us a call 01202 631734 or 07979 908000 to chat. Rest assured you can get a competitive deal and excellent personal service. Alternatively come and see John and the family at one of the shows around the country. Yes, we pack up the Staglers van, with lots of orange items and a huge variety of tasty chews onboard. Our opportunity to meet you and your wonderful pets in person. Book a date in your diary and we will see you there. Click on the show name to get all of the latest information and see how you can go too…..
DO YOU HAVE A FAVOURITE SHOW? Please let us know by emailing biscuit@staglers.co.uk and we will see if we can get there! This includes Olympia and the brilliant Horse of the Year Show. We aim high to please you. Fingers and paws crossed! 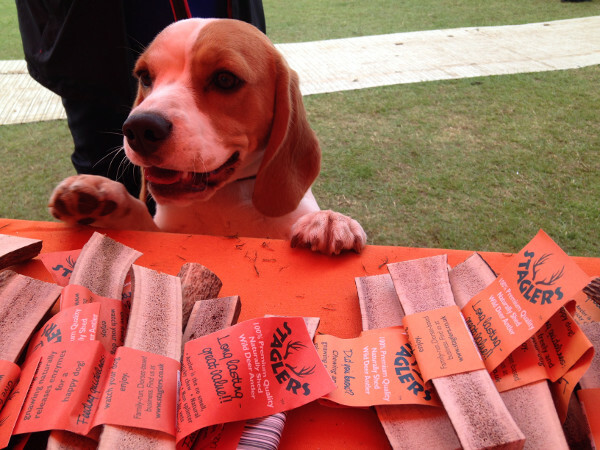 Grimsby pet treat manufacturer Tower Pet Products are launching the world’s first Marine Stewardship Council certified sustainable dog treats at Crufts this week. The new Sea Treats Fish Skin Jerky pet products for dogs are made using dried fish skins sourced from MSC certified sustainable fisheries. This means that the treats can be traced back to an independently verified sustainable source. Tower Pet Products are well known in Grimsby and in the dog treat industry for their Mariner’s Choice range. The fish skins are a fresh nutritious product left over from skinning cod and haddock used for human consumption and make a good use of an otherwise underutilised part of the fish. All of them can be traced back to MSC certified sustainable fisheries in the North East Atlantic. A natural dental aid, Fish Skin Jerky is also low in fat using only the best-managed fresh, raw materials sourced from responsible suppliers. To find out more about Sea Treats, visit www.seatreats.shop or visit Hall 1 stand 108 at Crufts at the NEC Birmingham and enter a competition for a chance to win a goody bag of the UK’s first MSC certified dog treat.